As sweet as cinnamon: Another version of Lesley's Peg Bag! I have been a little excited...LOL..
so ask your local Borders for ordering information. I have added another version of 'Lesley's Peg Bag' to go with it. for a special price of $2.50 for April only. of the peg bag within 24 hours. Purchase a copy for yourself or as a gift. project for you to make. and some small conversations from my DD's. and the epicentre was just in the foothills not far from us. than normal last night to wait and see what next???? But alas no more shakes and sleep we did. CONGRATULATIONS!!!! How wonderful to have your peg bag in Homespun, It's just lovely! Way to Go, Dawn! 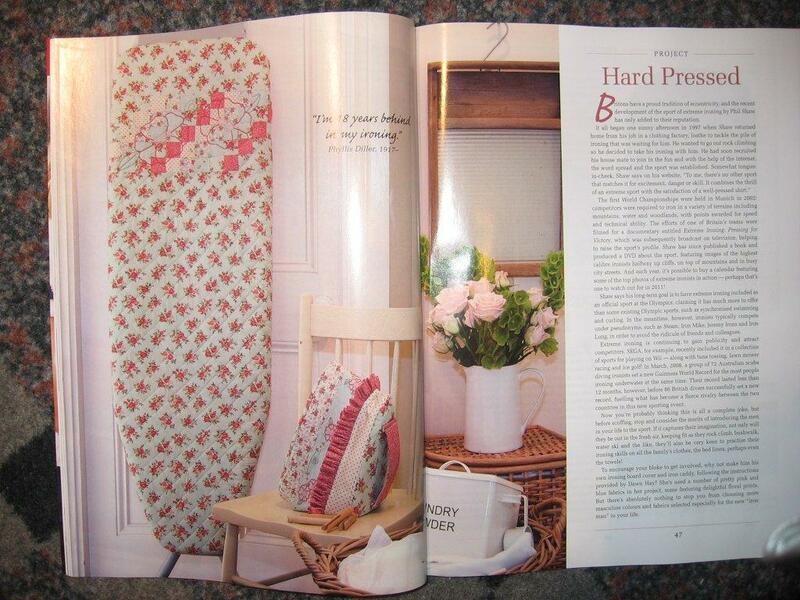 Ooooh your patterns look so loverly in Homespun!!! What a gawjus peg bag to go with them :o). That earthquake would have been so scary ... did the tinies sleep through it?? Gosh I hope so!! Gday Dawn ! the peg bag i can tell everyone is lovely as i have seen it so grab yourself a bargain !! What a shock it must have been to feel the earth moving. As Valentina above said, we experienced quite a few in Cyprus. one was quite bad and caused a lot of damage. In our kitchen we saw the floor lift like a gentle wave on the beach. It seemed to undulate before settling back down again. Thankfully you didn't experience any more tremors even though the epicentre was quite close to you. Your pattern in the magazine looks fantastic from what I can see in the pictures. The ironing board cover is just gorgeous and makes a boring piece of laundry equipment look attractive and I absolutely adore the little iron shaped bag for the iron. Sadly, here in England the Borders bookshops where I always bought my foreign magazines, went bust in the recession and all the shops closed down last year. I don't know if it's the same in other countries. Ooh darlin' your peg bag is way too cute and definitely a must-have to go with the rest of the laundry make-over!!! I'm shocked to discover that Borders went bust in England. It was huge! That's an adorable bag!! Sounds like the ground is shaking all over. I hope you don't get anymore, hate that rumbling sound before they hit. Love the peg bag Dawn. Yes people in S.A. were talking about the earthquake. We didn't feel anything out this way.